All Members and Guests must ensure that they are wearing the appropriate golfing attire whilst on the golf course. Please do not be offended when you are asked to leave the golf course, if you do not follow our dress code. Kitchen Opening times are now 10.00 - 3.00. Any food requirements outside these times need to be pre-booked or purchased via the halfway house. With a highly-rated golf course suitable for players of all standards and a selection of function rooms, is it any wonder that Ruddington Grange is such a popular venue for golf days and societies? The Professional staff are totally geared up to work with clients to ensure that everyone taking part has a thoroughly enjoyable experience - on and off the course. They can even arrange for you to have personalised equipment... balls, tees, sweaters etc. Various packages are available, itemised below, and if your party includes a Captain or Secretary from another golf club, they will be entitled to a golfing concession. Your reservation will only be confirmed on receipt of the booking form, together with a non-refundable £50 deposit. Final details of your requirements are required 3 weeks in advance of your booking in order to reserve your tee times, before availability is opened up to members. Final numbers should be notified to Ruddington Grange no later than 48 hours prior to the event. Please be aware that you will be invoice upon these numbers. 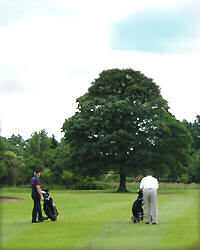 + £7.00 - 27 holes of golf, + £12.00 - 36 holes of golf. 1-Course Society meal - Fish & Chips, Steak Pie, Cumberland Sausage and Mash, or Pan Fried Chicken in Cream Sauce. please note … Breakfasts or snacks required before 10am must be pre-ordered. Payment of green fees and catering is to be made in the Professional's Shop before play commences and any bar accounts must be settled on the day unless prior arrangements have been agreed with the office. Handicap certificates are not essential but in the interests of everyone using the course, only guests with golf experience should be invited to play. Dress rules for the Golf Club and Clubhouse must be adhered to by all members of the party. It is not acceptable to wear athletic or beach shorts, gentlemen's sleeveless or collar-less shirts, denim trousers, canvas or training shoes, or jogging suits. Tailored shorts with ankle sports socks are required, as are roll-collared shirts or sports shirts with a collar. Pick up in fourballs when your ball cannot influence the result. Never play until those in front are out of range. Move off the green when play of the hole has finished. Do not putt after the hole has been won. Call following matches through immediately a ball is lost. You must continue to play within five minutes but this does not mean you have five minutes to look for the ball. Always play without undue delay - do not waste time. Invite better players to play through even when you are keeping pace. The players in front may be slow also and the whole course may be held up. Remember that good players may still be waiting when they are 250 yards behind you. There is ample car parking space and organisers should ensure that members of their party do not park in named car spaces or anywhere in front of the buildings.